DECOPROYEC SUBERTRES S.L. is a manufacturer of PROJECTED CORK, a patented 100% natural product. The main component is cork (the best natural insulation) taken from the cork oak tree. 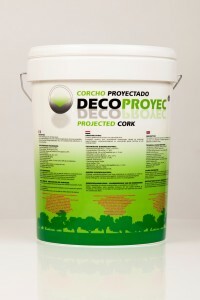 PROJECTED CORK DECOPROYEC is a single component product in its use and once the packaging is opened there is no need to add other components for its use. 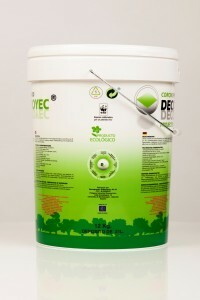 At the same time it is manufactured, anti-mold and natural preserving agents are added by DECOPROYEC. 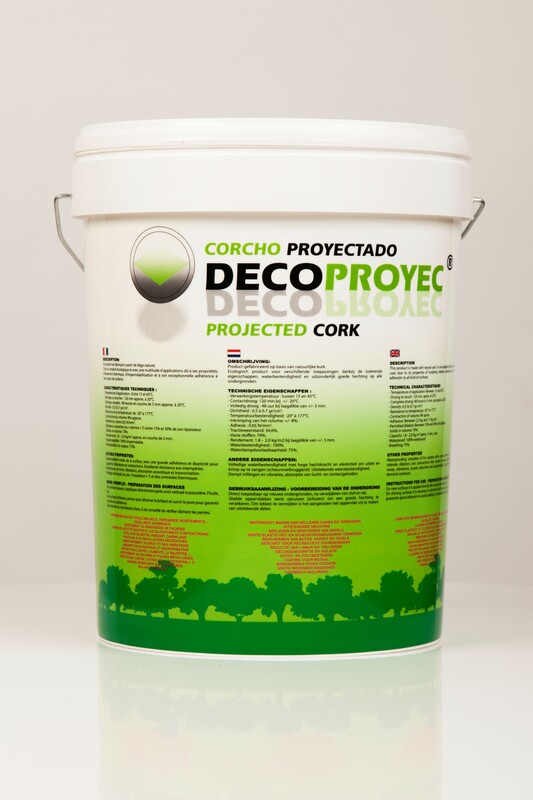 PROJECTED CORK DECOPROYEC is packed in strong, light, plastic bags, manually sealed and introduced into plastic containers, also closed and sealed. This process guarantees optimum insulation from the air and eliminated any accidental contact with the air in the case of an accidental split in the plastic container cover, because the PROJECTED CORK product dries through oxidation. The containers, besides being printed with the indications of the properties and different ways of using the product, also have labels indicating the date of manufacture and recommendations as to the last date for its use. The procedure for the preparation for use of the product consists of the following:Take the product out of the plastic bag, transfer it to the empty plastic container or in any other container you wish to use and continue with the beating phase until you obtain the required liquidity and density. The beating takes place using a professional electric beater of medium/high strength used at moderate speed using a medium sized beater (about 12-14 cm. diameter); in order to beat the product of a container of 11 kg. about 2 or 3 minutes is the time required. The beating process allows the aeration of the product and it increases considerably in volume, one of the main characteristics of PROJECTED CORK DECOPROYEC, and it completely fills the plastic container provided. It is not advisable to divide the product in parts before beating because, after its manufacture and preparation, the liquid components are mixed in a nonhomogeneous way in the interior of the container. The correct procedure would be the beating of the whole container and after, if necessary, the separation of the product into different parts. PROJECTED CORK DECOPROYEC can be applied to a large number of different surfaces (façades, roofs, terraces, floors, walls etc…….) giving them the ultimate solution for problems related to humidity, sound and heat insulation, decoration and aesthetics any man y more applications that we could help you discover. The finished surface of PROJECTED CORK DECOPROYEC is granulated and decorative, along with giving complete waterproofing and having high breathable qualities. These facts allow it to be used in all facets of building and decoration, and it has a recommended thickness of 3-4 mm. 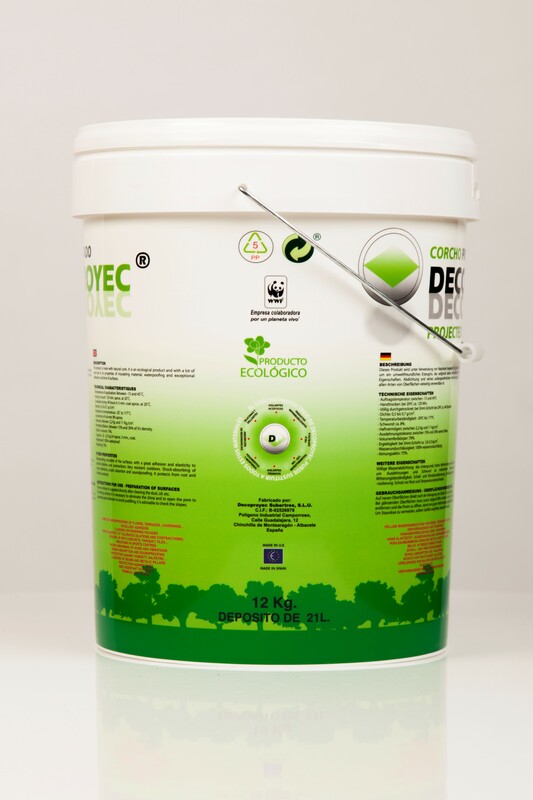 The fixative emulsion DECOPROYEC is used as a first coat to increase the adherence of the PROJECTED cork when applied to uneven or deteriorated bases. It can also be added to PROJECTED CORK DECOPROYEC in order to obtain a more fluid mixture and the compatibility of the two products is total. It can also be used in waterproofing applications for an even more guaranteed execution, being applied between applications to guarantee protection. The surface to be treated has to be cleaned, prepared and consistent, it can be slightly damp but not soaking in water and it is imperative to eliminate dust and lime, nor is it convenient that it has various coats of old, cracked, unsecure paint. In the case of deteriorated, cracked surfaces with fissures of more than ½ mm, the surface has to be repaired first. It is imperative to chip away and thoroughly clean the deteriorated and inconsistent areas and skim them with a cement and sand mix or special filler, in such a way that the surface becomes regular and smooth, completely level and with no imperfections between the repaired areas and the non-repaired ones in order to obtain an impeccable finish. In the case of surfaces composed of asbestos or duralite, it would be necessary to clean them of dust and scrape away the molds. The surfaces which are not to be treated but are next to ones that have to be, have to be completely protected (roofs, tiles, windows, doors, etc.). This protection has to be removed before the complete drying of PROJECTED CORK DECOPROYEC, otherwise, unless a cutter is used, it is possible that on pulling the protection away, part of the PROJECTED CORK DECOPROYEC is also removed by accident. The cleaning of the tools used and the surfaces dirtied during the application should be done with water before the total drying of PROJECTED CORK DECOPROYEC so that not more time than necessary is spent on the final cleaning. The fixing emulsion can be applied as if it were a paint (brush, roller, pouring, pistol or a machine for projection with a nozzle of 6mm. The filler (used for filling in cracks or fissures, or to make surfaces uniform such as a very thin skim) can be applied with a spatula or a trowel. The application of PROJECTED CORK DECOPROYEC is by means of a projection gun (the use of a special gun adapted for the projection of cork is recommended) following the technical details attached, and with nozzles of 6 mm. The pressure that should be used (3.5 – 4.00 bar) and the distance from which to project derive from the experience af the operator of the machine and the desired result that we wish to obtain. It is not advisable to increase the pressure more than 4.00 bar, nor to spray nearer than 25-30 cm nor further away than 70-80 cm. The surface before application must be dry, clean and healthy, and if there are cracks these have to be sealed with filler. In the case of old cement surfaces or porous materials, the drying time will be 24 hours, depending on the temperature. It is advisable to realize all work during the summer months. 8-12 hours after application, an unexpected shower will not compromise the work already done and will only delay the drying. In the case of non-porous surfaces or damaged asphalt sheeting the drying times could be longer than normal. In the case of asphalt sheeting it is necessary to lift and remove the areas that have become unstuck, refill these areas and seal where they join the rest of the surface with filler and make the surface in general uniform and level. Finally PROJECTED CORK DECOPROYEC can be applied. When the application of the product is on terraces it should also be extended beyond the parameters of the actual terrace and take in part of the vertical limits to a height of, at least, 30 cm, these having ben chipped and cleaned before the application in a way that once the areas have been covered with PROJECTED CORK DECOPROYEC, these remain in the same plane as the areas not treated and covered, without appreciating different levels. This is done in order to avoid infiltrations once the covering has been applied and so obtain an optimum finish. The recommended way for application is to apply a first coat, wait until it is perfectly dry and then apply the second coat. The application of one thick coat is not recommended as, when drying, this could crack. Nor is it recommended applying the second coat over the first which is not completely dry, because the first would then “pull” the second coat, cracking it and causing it not to adhere. The hand of the person projecting has to move in a uniform way, without pauses, and this is only possible through experience; in general it is convenient to apply a coat of approximately 1,5 mm. of the product PROJECTED homogeneously over all the surface to be treated, let this dry for 24 hours and then apply a second coat. During this time the first coat is about to dry and its final colour can be appreciated, the defects of the first coat can be seen easier, until the experience of the worker projecting reaches its optimum level, the areas where little or no product has been applied. At this phase of the drying process the colours are different according to the amount of the product applied with the first coat.